The Escura Instant 60s strips photography down to the absolute essentials for a vintage-inspired camera that doesn’t need batteries. And if you don’t mind a little modern battery power, the camera can be paired with an external, off-camera flash with a matching vintage atheistic. The Escura works without electronics, thanks to a traditional camera design and a hand crank to pop out the Instax Mini film. The Escura uses a minimalist control scheme with an option to switch between an f/8 and f/11 aperture, a shutter release and the option to switch from a 1/100 shutter speed to bulb for longer exposures. The camera does not even have a viewfinder, though that is one of the camera’s Kickstarter campaign stretch goals. 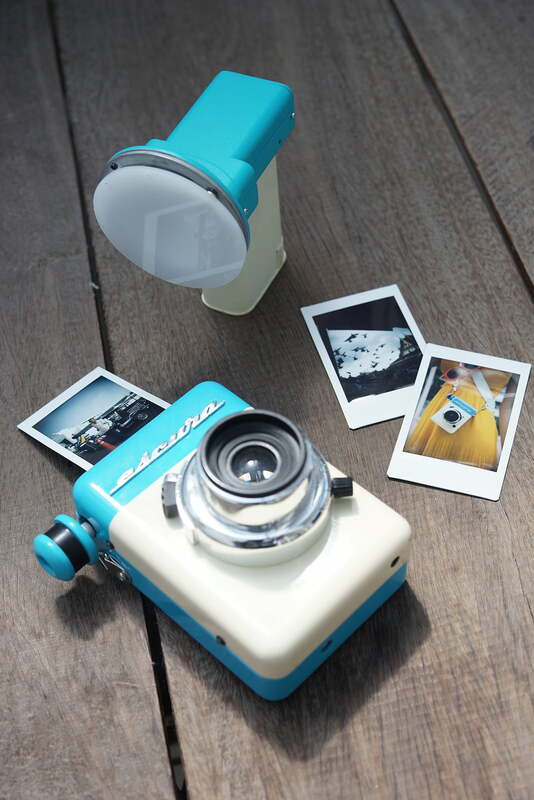 The company says the camera produces instant images with saturated colors and soft vignetting using Instax Mini film. Like many instant film cameras, the focus is fixed. While it’s not hard to find an instant camera, the Escura has an option for using an external flash, styled after a vintage flash gun. The flash is triggered using a shutter release to fire the camera at the same time. The flash also includes flash gels for adjusting the color of the light. Both the camera and flash use a design inspired by the 1960s. The Escura comes after a six-year hiatus from the brand Carbon, which launched the One Mini in 2012, modeled after the Polaroid SX-70. The brand is part of Graphics Guides Design Company, a company based in Hong Kong. The Escura isn’t quite ready for shipping yet, however — the company is taking to Kickstarter to raise the final funds necessary for improve the lens and finalize the prototype. Early backers willing to take the Kickstarter risk may be able to get the camera for about $ 48, which is about 25 percent off the expected list price, or $ 67 with the flash. If the project is successful, the company aims to ship the camera in February and March. While the Escura isn’t the brand’s first camera, it is the brand’s first Kickstarter project. The campaign aims to raise about $ 38,250 by November 28 through crowdfunding.